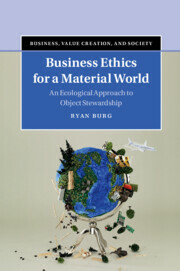 Interactions between business, society and ethical values are proving critically important at the start of the 21st century. Corporate behavior is now firmly on the public agenda, and with new insights constantly developing within academic and business practitioner communities, this new series responds to a need for critical and reflective analysis, drawing on the latest academic research to answer pressing practical questions about business and its ethical management. Theoretical and empirical approaches are explored, shedding light on the complex business relationships which create and sustain value in today's global corporate environment.